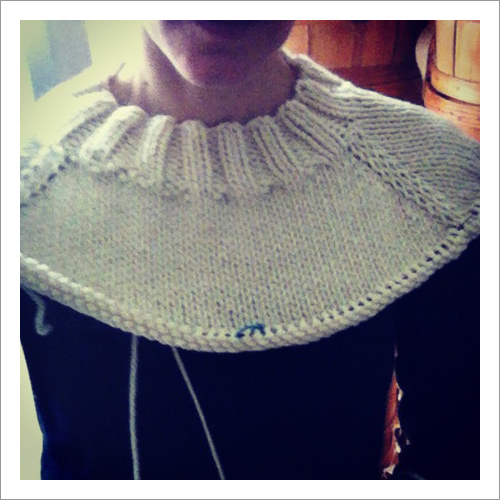 In case anyone’s wondering, I did indeed cast on for an ivory pullover on Sunday night, loosely following the Agnes pattern. (I wanted to see how the pockets are done.) I started out knitting the front and back in seed stitch, just to give in a minor amount of interest, but wound up ripping it back. I have a few different ideas about what I might want to do with the body, so will be doing the arms first this time, while I ponder. More show and tell when I’ve decided where I’m headed with it. Happy Friday, and I hope everyone has a wonderful weekend. Thanks for all the great conversation this week! ive been wanting to cast on for agnes as well! Im slightly skeptical about the a line shaping of the bottom of the sweater on me, (im petit with huge hips!) so it might not be too flattering on me hah, Good luck! You are going to love it. Check out some of the notes on Rav for adding length to the body and you may want to opt for the other other row increase through the arms. Cast mine on in Fibre company Tundra. What cool color did you choose for the pockets? I’m not actually using any of her numbers. The only resemblance so far is that it has an extra-wide, unshaped neck and m1 raglans, (which I regret). My cast-on count was different, and my gauge is slightly different, so I’m doing all my own sizing and shaping as I go. I guess it’s really more Barbara Walker than Agnes. But that was my jumping-off point. Haven’t decided whether I’ll do the pockets or not — depends on what else I decide about the body. The yarn is Malabrigo Chunky (natural), which I forgot how much I love knitting with. Delicious. I’ve never taken a shine to seed stitch although I remember once listening to a couple of knitters go on and on about how much loved it. As for Malabrigo anything, I’m a fan! I love seed stitch, but something about that big a field of it, at this gauge, in off-white, felt like it was going to look like I was wearing a bath mat or something. I love it as well, but it kills my hands! Think this will look fab just simple and chunky, though. Woo this is such an adventure! I’ve been loving all your chunky knits recently! Looking great! You have such a way with style….and knitting :) Excited to see more of this one!